Aretha Franklin, who died today at the age of 76, was the greatest R&B singer of all time and one of the most legendary entertainers of the 20th century. She also did a wrestling thing once or twice. If you were a young wrestling fan in 1987, you will always associate Aretha Franklin with WrestleMania III, a show that marked the apex of the WWF’s Hulkamania era. Close to 100,000 people packed the Pontiac Silverdome outside of Detroit to see Hulk Hogan defend his title against his former friend Andre the Giant in the main event of a show that also featured Alice Cooper as the second for Jake Roberts, Roddy Piper’s (short-lived) in-ring retirement, and Randy Savage and Ricky Steamboat’s legendary Intercontinental title bout, which was the greatest WWF match of the 1980s. WWE hasn’t posted the footage of Franklin singing at WrestleMania III to YouTube, so unfortunately we can’t embed it here. We can, though, embed this tweet from current WWE sensation Mustafa Ali, which includes a video from WWE.com. 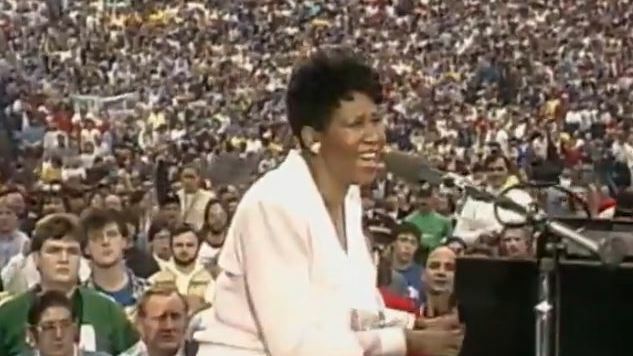 This is definitely a very minor and insignificant part of Franklin’s legacy, but for those who remember thrilling to WrestleMania III, her beautiful version of this American classic will never be forgotten.